The trial of football star come actor OJ Simpson, for the murder of his estranged wife Nicole and Ron Goldman, a waiter who was in the wrong place at the wrong time, riveted America for months. Those of age at the time watched it daily in full on live TV. As fascinating as all that was, the entire story is even more fascinating. And revelatory. Much credit goes to producer/director Ezra Edelman, for this exhaustive and incisive examination of the whole affair, its reflection of American culture and how it changed the dissemination of information thereafter. 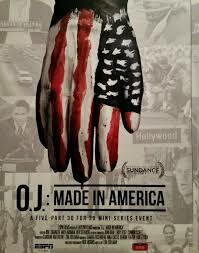 “OJ Made In America” is documentary film making of the highest order, well worth watching in the entirety of its five episodes.